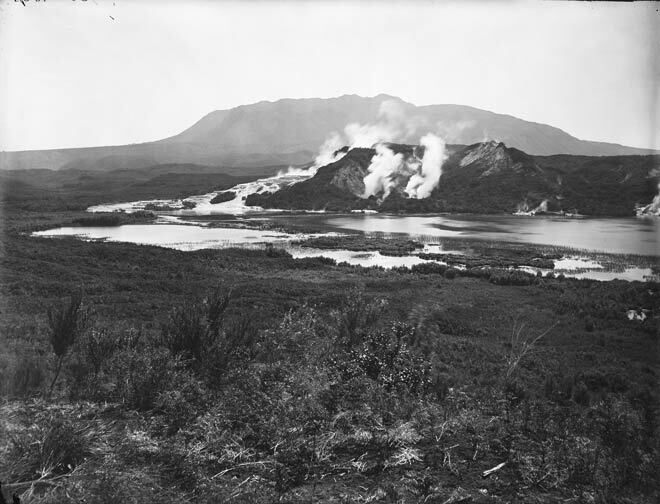 This 1886 photograph of Lake Rotomahana and the White Terrace (centre left) is part of a panorama taken before the Tarawera eruption that year. Mt Tarawera is in the background. Although the Kaharoa eruption had spread ash over the area about 570 years earlier, no one at the time this photo was taken was aware that Tarawera was an active volcano and about to erupt again. I was in Rotorua early last year and visited a number of the popular tourist destinations. What an amazing part of the world! I had never heard of the pink and white terrances before my visit but was intrigued by the old paintings of them. What an absolute shame they are not there now. I'm sure they were truly magestic to behold.